Lindblad's nimble expedition ships offer a close-up view of glaciers, icebergs, vertical fjord walls, waterfalls, seals floating on pack ice, and more natural features..which are the reason you come to these wild northern realms! Our ships' smaller size allows us into narrow inlets and secluded bays that big cruise ships can't access, while full stabilization and cutting-edge technology ensure comfortable, safe transit. With fewer guests aboard, you'll enjoy personal connections with our ship's expedition team, including naturalist guides and seasoned crew. This is an authentic expedition-style cruise with a world-class polar captain, crew and staff. 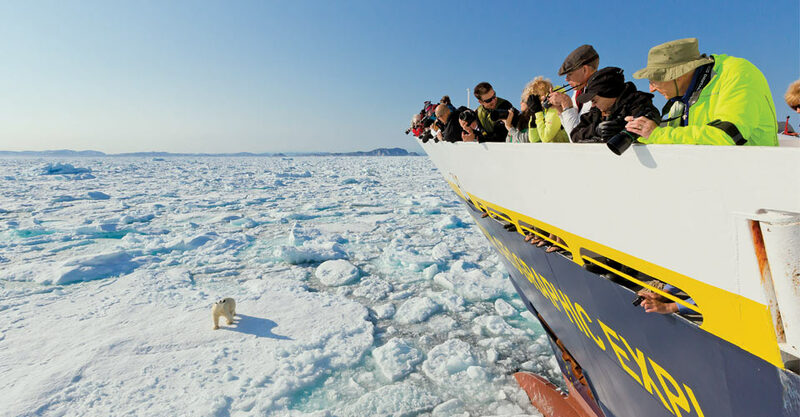 Lindblad was the first commercial company to take travelers to the world's polar realms, and today draws upon more than a half-century of experience in the often challenging ice conditions Arctic waters can present. Our onboard team includes a veteran Expedition Leader, assistant Expedition Leader and a corps of naturalists with specialties pertinent to our destinations. A National Geographic-certified photo instructor also travels with us to help guests get outstanding photographs of dramatic scenery, Arctic wildlife and local communities. A hallmark of a Lindblad cruise is the wide array of choices you have for each day's adventures. From motorized Zodiac rides to self-paddled kayaks, guided hikes and nature walks to horseback rides and bicycling, educational museum tours and archaeological site visits, you're immersed in the nature and culture of our destinations. You choose what you want to do each day, and which guides you want to explore with. And, if you're new to something, like kayaking, members of the ship's team are always alongside to coach you—besides, our stable sea kayaks are practically untippable by novices! Given the expeditionary nature of our operations, we aren't confined to a strict timetable. If we're sitting in front of a glacier that's actively calving tons of ice, we can stay and watch. If the weather is better halfway down a long fjord, we can chase the sun. If too much ice chokes our access to one place, our ship's captain knows where else we can go for clearer sailing. Flexibilty lets us craft the optimal adventure cruise for our guests. An undersea diving specialist is an exciting addition to our Arctic voyage. Carrying nearly 200 pounds of specialized equipment and wearing heavy gear ensuring survival in frigid waters, our diver shoots high-definition footage of the undersea realm. Even among all this ice, marine life abounds, from whales to seals to varied fish and much tinier creatures. Each day, the footage is shown on plasma TV screens in the ship's lounge. The ship also carries a remotely operated vehicle (ROV) that can dive as deep as 1,000 feet to reveal submarine realms as unexplored as the surface of the moon. By sharing videos of potentially new species with scientists, Lindblad Expeditions contributes directly to scientific research. A video microscope helps naturalist guides show and explain various elements in the Arctic environment, including tiny organisms in the marine ecosystem’s building blocks—like a krill’s body, at 80x magnification. Atop the ship’s mast, a crow’s nest camera surveys our surroundings, offering a 360-degree view that you can watch on your cabin television. And below the surface, underwater microphones let us listen to Arctic marine mammals, revealing the otherworldly sounds of whales swimming near us, and other marine life. You'll cruise with an avid expedition team whose in-depth knowledge brings our Arctic environs alive. They are selected in large part for their expertise about the natural and cultural history of the areas we visit, though they are also warm, gifted communicators, adept at making scientific research clear and accessible for our guests. Each voyage includes an Expedition Leader, a team of seasoned naturalists, a National Geographic photographer, an undersea specialist, expert guest speakers, a video chronicler and a wellness specialist. The team's focus is the Arctic, and you'll hear from diverse speakers including wildlife biologists, ornithologists, marine scientists and polar historians. Natural Habitat Adventures is a world leader in environmentally responsible travel. We were the world’s first 100-percent carbon-neutral travel company. And we continue to break ground in innovating practices that help to protect our global environment. Because of our concern for the natural world, we are enthused to partner with Lindblad Expeditions as the operator for our Adventure Cruises, a company that shares our values and commitment to conservation. 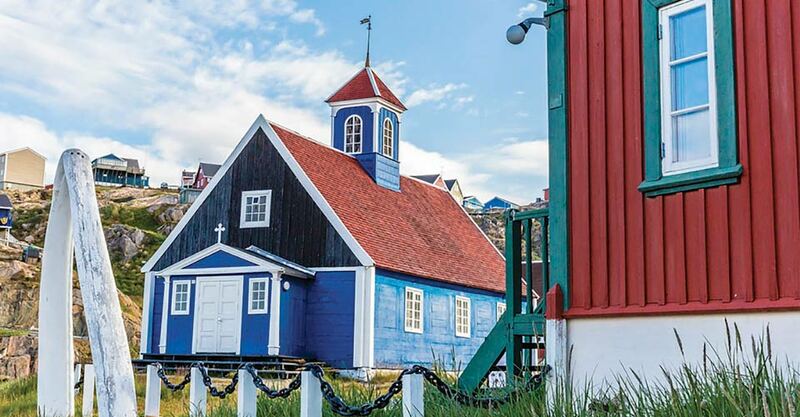 Fill out the form below to receive additional information about our Exploring Greenland & the Canadian High Arctic. Hi Nat Hab, I’m interested in your Exploring Greenland & the Canadian High Arctic. Can you please contact me with more information?